Expansion of public infrastructure, establishment of new industries as well as growing IT infrastructure are expected to drive the diesel genset market in Indonesia. Further, the development of IT & telecom sector of the country along with growing number of SMEs due to rising FDI in the commercial sector would generate more demand for diesel gensets in the country. The growth in tourism sector is expected to drive the need for new hotels, which requires diesel genset for power back up solution. Major cities of Indonesia including West Java, Jakarta, Cilegon and Bandung, are also welcoming new agricultural and industrial facilities, which would surge the diesel genset market during the forecast period. The Indonesia diesel genset market report comprehensively covers the Indonesia diesel genset market outlook report by kVA rating, applications and regions. 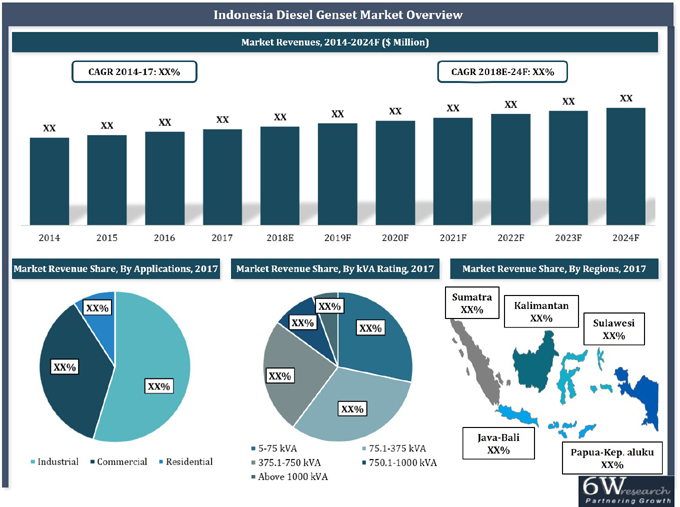 The report provides an unbiased and detailed analysis of the Indonesia diesel genset market trends, opportunities/high growth areas and market drivers which would help the stakeholders to device and align their market strategies according to the current and future market dynamics. •	Historical Data of Indonesia Diesel Genset Market Revenues & Volume for the Period 2014-2017. •	Indonesia Diesel Genset Market Size and Indonesia Diesel Genset Market Forecast, until 2024F. •	Historical Data of Indonesia Diesel Genset Market Revenues & Volume, By kVA Ratings for the Period 2014-2017. •	Market Size & Forecast of Indonesia Diesel Genset Market Revenues & Volume, By kVA Ratings, until 2024F. •	Historical Data of Indonesia Diesel Genset Market Revenues, By Verticals for the Period 2014-2017. •	Market Size & Forecast of Indonesia Diesel Genset Market Revenues, By Verticals, until 2024F. •	Historical Data of Indonesia Diesel Genset Market Revenues, By Applications for the Period 2014-2017. •	Market Size & Forecast of Indonesia Diesel Genset Market Revenues, By Applications, until 2024F. •	Historical Data of Indonesia Diesel Genset Market Revenues, By Regions for the Period 2014-2017. •	Market Size & Forecast of Indonesia Diesel Genset Market Revenues, By Regions until 2024F. 13.3 Deutz Asia-pacific (Pte.) Ltd.
13.5 FG Wilson Asia Pte Ltd.
13.7 Mitsubishi Heavy Industries Engine System Asia Pacific Ltd.